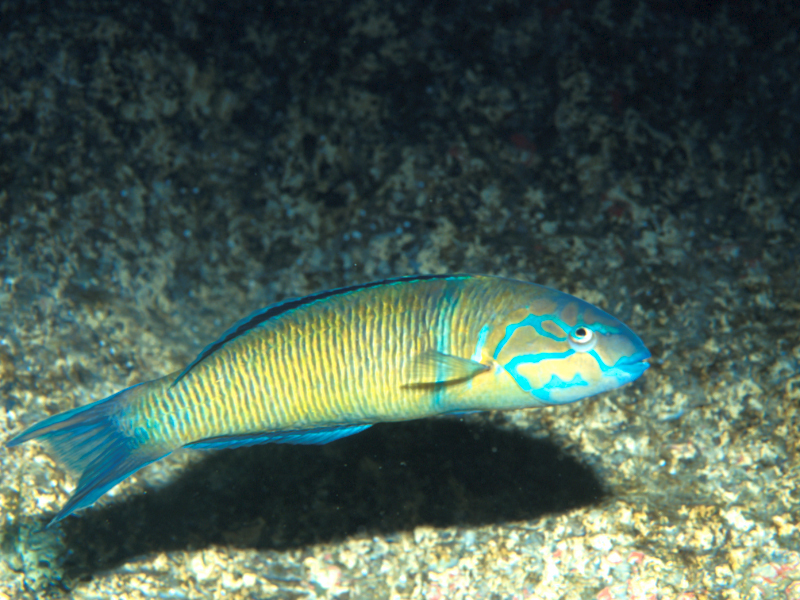 The ornate wrasse is an animal with different colourings depending on whether it is male or female (sexual dichromatism). The females are brown-green with a dark vertical line on each scale and five bluish vertical bands. The males have red heads with sky blue stains. Just behind the pectoral fin they have a vertical blue line with a red trim. It has a long, compressed body, and a sharp, oval head. Its beak is short with a short, terminal mouth and thick lips. The caudal fin is truncated in young individuals, but in adults it has the shape of a half moon with elongated lobules. The females and the young usually form small groups; the adult males are solitary, except for breeding times when the jealously watch over their hareem. This species is a very skilful, untiring swimmer. When night falls, the fish are buried on their sides in the sandy beds by vigorously shaking their tail, and spend the night there. They eat small molluscs and crustaceans and are therefore carnivorous. Their reproduction is oviparous. They are sequential hermaphrodites: there is sexual transformation from female to male, which involves a change of colour. The fact that there is a change from female to male and not the other way round, has an advantage: there is always a large number of young, small females capable of producing a large number of eggs. The number of older, larger males is considerably lower due to the danger of predators. However, as the amount of sperm produced by one male is higher than the amount of ovules produced by the female, a male is able to fertilise many females. The ornate wrasse lives on rocky beds with growths of algae and marine meadows, from surface waters to depths of 50 m.
It is found in the eastern Atlantic from Portugal to the gulf of Guinea. In the Mediterranean it is more frequent in the south. The young and the females regularly clean other fish.